That’s how top financial blogger Roger Wohlner describes 401(k) Fiduciary Solutions, Christopher Carosa’s latest book. 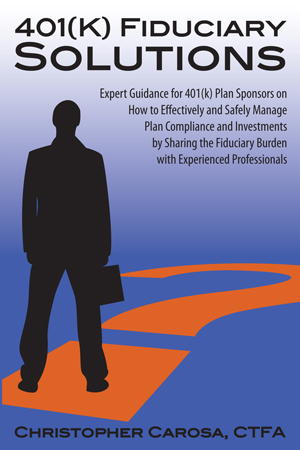 401(k) Fiduciary Solutions covers all areas of fiduciary liability and representations a valuable resource for 401(k) plan sponsors, their service providers and even those more sophisticated plan participants, who may find the book a helpful guide for advice on how to actively monitor plan performance and regulatory compliance. Mr. Carosa, chief contributing editor of FiduciaryNews.com, has written more than 300 articles on fiduciary and investing topics. He has been a successful investment and portfolio manager for three decades and enjoys sharing his knowledge and experience with others facing the same compliance issues as he does. 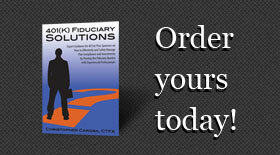 In his recently published book, 401(k) Fiduciary Solutions, Carosa covers all 401k compliance issues in a single reference source.